Home | Loving Angels Care. Outstanding family run care provider in Bracknell and Northampton. We are Loving Angels Care. Providing outstanding home care in our community. 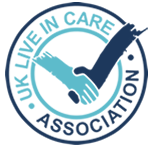 Call us today on 0333 355 3126 for a free care needs assessment. Providing outstanding home care to our community since 2014. Loving Angels Care is responsible for delivering major contracts for a number of large public sector organisations, as well as delivering care services to a large and growing number of self-funding clients. We aim to tailor our care to suit the individual user's needs and make adjustments as their requirements change over time.